Another notable-for-furry-fans young adult fantasy adventure series from author Kevin Gerard: Conor and the Crossworlds. “A Boy, a Mystical Creature, and the Journey of a Lifetime . . . Conor: An innocent ten year-old boy, not unlike other boys anywhere . . . Purugama: Immense, powerful, magical, a towering champion of the crossworlds . 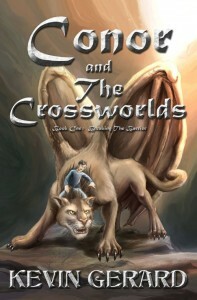 . . A young boy subconsciously calls forth the power of the crossworlds creators. They send the mystical beast, Purugama, to accompany him on a fantastic journey. After revealing a number of possible futures to his young companion, Purugama prepares to return him to his home. His plans are interrupted when Drazian, Purugama’s mortal enemy, faces the immense cougar in a ferocious battle. The prize? Conor’s life, or death, depending on the ultimate outcome . . .” As with his other series Diego’s Dragon, the author has created a Conor home page that features video previews and lots of other bits of information. The series is published by Author House.